Growing up there was always the “play pen”....an entrapment, such as a pack-n-play that allowed babies to play safely, alone. These items have gotten a swift upgrade! The last few weeks Nixon has been testing out a Born Free Nisa playard. My favorite thing about it so far is the size. Nixon doesn’t feel that she’s trapped and SHE LOVES TO PLAY IN IT. I keep her favorite toys in it and I keep it next to my desk so she can play while I’m working. It’s so easily moved and traveled with. It also comes with a cover for the top and a carrying case which makes outdoor activities a breeze! The Nisa Playard creates a safe place for my little explorer, It literally sets up in seconds for a day at the beach, the park, or even our living room. The unique, pop-open design opens and closes with ease and is ultra-portable. The removable, oversized canopy with mesh panels protects babies from elements while allowing proper ventilation. Plus, it folds with the canopy attached. Pop Open: The nisa opens in seconds with its pop-open design. The real bonus is that you can keep the canopy attached when you’re ready to fold and go. 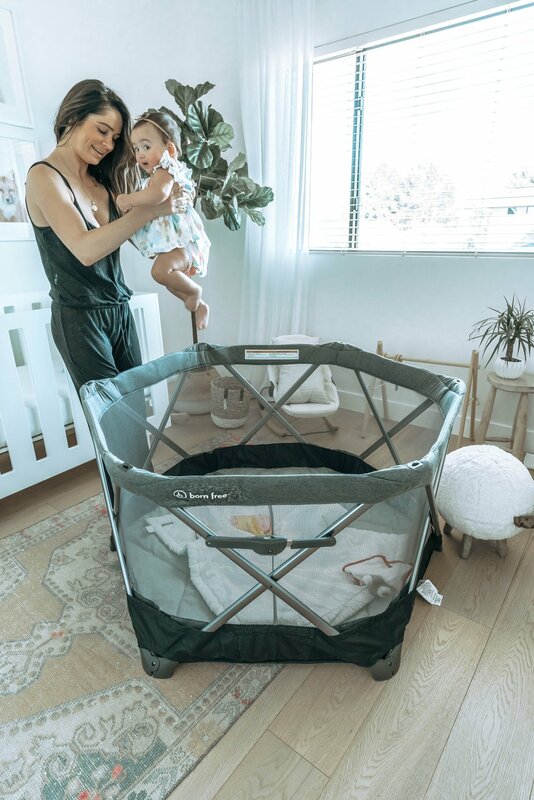 Simply, push the top of the canopy down and watch it seamlessly store in the playard. Oversized Canopy: The 6-panel canopy features 3 mesh panels allowing for optimal air ventilation. The center panel zippers down on both sides to easily access baby. For indoor use, the canopy can be easily removed with just a few clicks. Padded Playard Floor: Whether we are indoors or outdoors with our nisa playard, Nixon is comfy! Machine Washable Fabric: The fabric of the playard is one piece and easily removes for cleaning. When things get messy, we simply toss it in the washing machine. Indoor & Outdoor: The nisa can be used both indoors & outdoors. Travel & Storage: The compact fold and carry bag make it the perfect companion for all our adventures. This post is sponsored by Born Free. All opinions are my own.